Karachi Literature Festival (KLF) is the literature festival that provides the connection between the author and the reader. It is also a platform for art performers and cultural programs. The festival starts with the welcome speeches by the organizers followed by the performance by Asif Sinan. Then there was an Award ceremony of KLF Pepsi and the winner of the prize for the non-fiction book of the year was “The Raj at War” by Yasmeen Khan. The Getz Pharma Prize for fiction went to Omar Shahid Hamid for his “The Spinner’s Tale”. The Infaq Urdu literature prize went to Nasir Abbas Nayyar. First day was concluded by a captivating ‘Kathak’ performance by Shayma Saiyid. This year there were 18 book launches at KLF but I really wanted to attend the launch event of Omar Shahid’s new book “The Party Worker” but unfortunately couldn’t reach the festival on day 2 cos I got sick. So I went to the festival on day 3 and at the entry there was stall of Tapal Danedar where people were standing in queues to get Chai/Tea proves that how much we love Tea. First I attended ‘Celebrating Faiz’ where Zehra Negah an Urdu poet praised his work by saying that, “He was an evergreen, extremely generous and down-to-earth man who was open to criticism.” Adeel Hashmi concluded the session by reading Faiz’s sublime poetry. After that I had to the Book Fair, first stop was Liberty Books to buy my copy of ‘The Party Worker’. And I found the some great collection Marvel and DC Comics at the some book stall at the end of the Book Fair. Last session of the day was ‘Memories and Reflections’ by Zia Mohyeddin who needs no introduction. It was a treat for me to listen him reading the paragraph from his book “The God Of My Idolatry”. 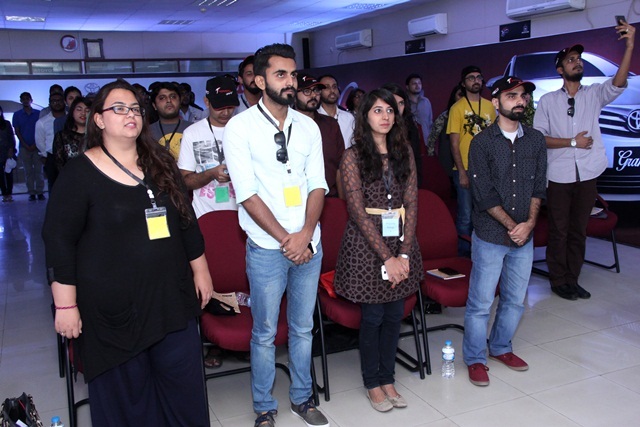 Then there was closing speeches by Ameena Saiyid and Asif Farrukhi followed by Performences by Shayma Saiyid and Suhaee Abro and a concert by Saif Samejo. Cassandra de Pecol aka Cassie is an American woman who wants to break the Guinness World Record for the fastest female to travel to all 196 Sovereign Nations in less than 3 years and 3 months. She starts her journey on 1st July, 2015. In 17 months she has been to 193 countries including North Korea, Iraq, Palestine and Kosovo. Her favorite region is Middle East. She wants to promote peace through sustainable tourism. All details about her expedition can be found at Expedition 196. Pacific Asian Travels Association (PATA) Pakistan Chapter and Asiatic Public Relations (APR) bringing her to Pakistan to visit Karachi, Lahore and Islamabad. Here she will be visiting cultural heritage sites, giving lectures at the universities and meeting media and press. Yesterday with Karachi’s Mayor Mr. Wasim Akhtar she planted Cedrus Deodara tree (the National Tree of Pakistan) at the Karachi Municipal Corporation Building. She also presented the peace declaration to the Mayor, Mr. Waseem Akhtar as a token of peace from her country to ours. Last night APR & PATA organized a Bloggers Meetup where Cassie shared her traveling stories from around the world. It was a casual meetup where she shared her traveling stories from around the world followed by a Q&A session. Do not research about a country before traveling, keep all perceptions about a country outta the door. Always pack light. You don’t need to look like a diva while you are traveling. Use apps like couchsurfing, airbnb , skyscanner and google maps to save costs. Buy one way ticket and don’t worry about the rest. Find job and experience the real life in a country. That’s the best way to travel. Back in December 2014 Red Bull Pakistan invited me to cover Jhal Magsi Desert Challenge Race 2014 It’s a yearly race event between 4×4’s like the Dakkar rally and the Baja it is on a very smaller scale compared to those events but is the most challenging of all 4×4 rally in Pakistan. I was so excited to witness this rally race on the track. The adventure starts on the morning of 20th Dec. We left Karachi at 7pm and reached Hyderabad after 2 hours then we stopped at Al-Zaib Resturant at 10am for breakfast. Then we left for longest road trip of my life till now. We stopped at some restaurant outside Larkana for dinner at 6.30pm. For first time I’ve tried Tikkain and Rosh. Tikkain was served with minced meat and fry kaleeji while Rosh is like Paya but they served piece of Rosh with minced meat, usually Rosh was served with the soup in which they cooked it for 4 hrs. Rosh was delicious and not so spicy while tikkain is dry and maash daal was okay. We left Shahdadkot at 7.30pm and then we reached Jhal Magsi after 16 hrs. At 2.30am they turned off all the lights were switched off. I thought this was the best moment to capture some night sky shots at Jhal Magsi. Orion constellation and Sirius (the brightest star system in the earth’s night sky) which was above our heads while Jupiter was rising from the East. We slept at 4am and woke up at 7.30am. After freshen up we went back side of our tents where drivers were staying in their camps to photograph their vehicles. I was amazed to see those vehicles and how they modified them for the track. One of the driver told us that there is a delay in race and now it will start at 10.30am due to fog. So we went to the starting point. And here we are at the Red Bull starting point where Ronnie Patel was waiting in his 4×4. It was one massive crowd waiting for race to start while media personals were setting their equipment. That was the initial starting point for the race but due to fog they shifted it to the other point which was 10km away from this point and the track was shortened to 100kms. So we headed out with our driver Mustafa to the new starting point in his Land Cruiser. It was one bumpy ride as he was driving off-road with the speed upto 120kms. At times it feels like we are part of this race. The race starts at 11.45am. Every driver was leaving with some difference of time. This year 48 drivers were participating in different categories. I was so excited to see this action live on track. Red Bull gives us the opportunity to explored different parts of this track including some jumps and the Muller River crossing so we can experience this race more closely. This was the first shot I’ve captured while standing near the jump. It’s bit hard to see them coming, all you can see is the dust cloud coming towards you. Here I’ve seen one of the best lift kits. After that we went to Muller River crossing. Where one massive crowd waiting for cars to passing by the river crossing. Then we headed towards the desert side of the track which was the tricky one due to the slippery sand and many drivers were stuck at this point. Making his way through the slippery sand. The race ends at 5pm. Then there was a prize distribution ceremony at 8pm. Nawab Zulfikar Ali Magsi and Marvi Memon were the chief guest. For the first they’ve introduced Ladies category in this race and this year only two ladies drivers were participating. Tushna Patel was the winner of Ladies category with time 2.03.34. She is the wife of Ronnie Patel and she was the first female ever to participate in the 9th Cholistan Jeep Rally 2014. She received her prize from Marvi Memon. Speedtrap was won by Zafar Magsi and Luqman from team Red Bull is giving him his prize money. Next morning we left Jhal Magsi at 9am and after 14 hrs of road trip we were back in Karachi at 11pm. The event was very well organized by Red Bull and their team. More pictures of this trip are uploaded here. As a co-founders of KHIBookSwap, yesterday I and Ifrah Waqar were invited by the British Council for a exclusive tour of their newly opened library located at the British High Commission on Shahrah-e-Iran, Clifton. Rabeea Arif, Manager of Libraries and Outreach Services and Maarya, Director Libraries at British Council Pakistan gave us a very brief tour of the library. I was expecting a librarian at the reception and the place will be filled with lots of bookshelves but I was wrong. It was very grey and bright space designed by an award winning architect. Library was equipped with lots of high-tech stuff. First there was a digital booth to check-in and checkout the books. A self-service counter, where you can checkout up to six books and four DVDs at one time. On the opposite side there was a huge shelve filled with lots of graphic novels. They’ve 800 graphic novels including all the famous Marvel and DC comics. Currently they have 12,000 books available in 20 different genres. All the bookshelves have wheels so they can easily be moved to create more space. They have one auditorium which can accommodate 100 people for hosting different literary events along with two study halls and they all had collapsible walls. They’ve planned some events for Roald Dahl 100th anniversary as Rabeea told us. At one corner there was very a colorful reading area for the children surrounded by children books. At the end of our tour Maarya gave us a demo of the Digital Table. It can be used to browse digital library, which has a huge collection of e-books, magazines, articles, digital media, newspapers. It also provides access to JSTOR – another digital library for academic journals, books, and primary sources. In between Rabeea Arif posted this picture on twitter. * Individual and Family membership are only available for the residents in Karachi while people outside Karachi can avail Digital Membership. The library will be open for public in August 2016. Every year Instagram announced themes of Worldwide Instameet. This year they select Earth Day as the them for Worldwide Instameet 13 (WWIM13). For the first time I organized not one but two Worldwide Instameets in Karachi and Thatta. First I announced Zamzama Park as the venue for #WWIM13KHI. But due to Heatwave from 22-24 Apr. in Karachi, I have to postponed it. On 11th April 2016, I received my instameet kit for WWIM13KHI. As I postponed instameet and rescheduled it to 24th Apr. 2016, management of Zamzama Park didn’t allow me to organized instameet on 24th Apr. as there was some other event going on. So then I decided to change the location to Manora Beach as it perfectly fits with WWIM13 theme. On the morning of 1st May, 17 people gathered to explore the beauty of Manora Beach. We met at Kemari Harbour at 8.30am and reached Manora Beach via boat at 9.15am, after an introduction I distributed instagram goodies and tasks to all the participants and then I spend some time at the beach. 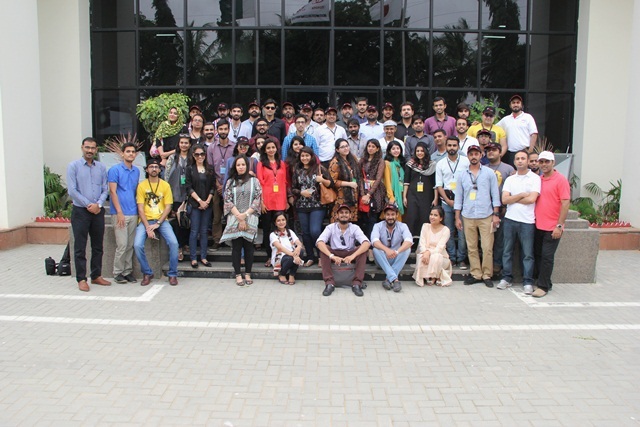 Our group photo at WWIM13KHI, where they took an oath that they will plant one tree this year. Our participants loved it so much that we spend 1 more hour at the beach. Overall it was a great experience to meet new instagragrammers. At WWIM13KHI we tried something different for our group photo. We made boomerang video at Manora Beach. More photos from this instameet can found at #WWIM13KHI and #Instameet_KHI and farmansha. On 23rd April, 2016 together with Noor Unnahar we organized the FIRST Official Instameet Thatta at Keenjhar Lake. Every year twice Instagram announced themes for Worldwide Instameet. This year’s theme was Earth Day. We planned a road-trip form Karachi to Keenjhar Lake, Thatta to explore the beauty of second largest fresh water lake in Pakistan. As we registered our Instameet, Instagram sends us Instameet Kit for our meetup. On Saturday morning we gathered at a meeting point and after having breakfast we started our adventurous trip. Reached Keenjhar Lake at 12:30pm. We had an introduction session followed by little speech by Noor explaining Instameet tasks. We visit very famous Noori Jam Tamachi’s grave in the middle of the lake via speed boats. When everyone got done with their tasks we left for the lunch. Stopped at Al-Makka Restaurant near Makli graveyard where we had biryani. Here we decided to visit Makli graveyard as it was quite near from that restaurant. Alhamdulillah! We reached Karachi at 6:30pm, all instagrammers had great time with us. You can find more photos of Instameet Thatta on my Instagram or #InstameetThatta and #WWIM13Thatta. Recently Jadirah, Noor and Areeba blogged about our Instameet on their blog. 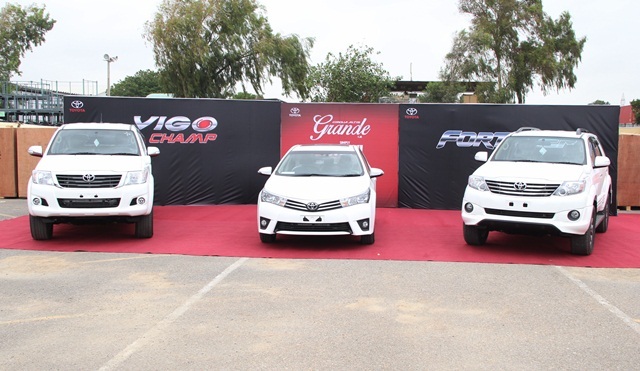 KARACHI: Indus Motor Company (IMC) on Monday held a meetup aimed at engaging bloggers at its facility at Port Qasim on 22nd August 2015. 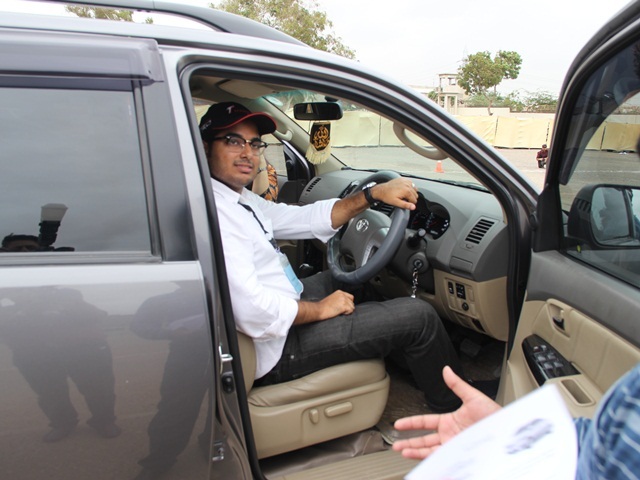 The day-long event was fully aimed to engage bloggers with first-hand, end-to-end experience of Toyota’s presence in Pakistan. The bloggers were briefed on various aspects of the organization, such as the elaborate safety protocols in place. The participants were given a detailed walkthrough on Toyota’s history and how it became the largest automakers in the planet. An exclusive tour of the manufacturing facilities was arranged for all the bloggers during which they met the key IMC personnel from Pakistan and Japan, observed the globally acclaimed Toyota Production system in play. The bloggers and online opinion-makers were also given an opportunity to test-drive the Corolla Altis Grande and Fortuner to experience the exceptional on ground performance and features such as cruise control and paddle shifting gears. The bloggers were briefed on the new Corolla Altis Grande, and informed of the car’s superior continuous variable transmission technology that provides excellent performance and unmatched fuel efficiency in its class of vehicles. They also informed that the new Corolla variants being manufactured in Pakistan now have more than 60 percent local components. The new Corolla has 760 additional parts made in Pakistan. Besides Corolla, IMC has further strengthened its product line-up to incorporate more options for customers in the country. These include the Hilux range of Commercial Pickups available in both 4×2 and 4×4 variants, Hilux Vigo double cabin pickups for thrill seekers and the Fortuner SUV for people who want superior, all-terrain vehicle with added comfort and luxury.